Demographic Trends: For all property investors and general investors alike, one of the key socio-economic trends to consider is the demographics of the country and region you are planning to invest in. It really is critical particularly for property since so much of the asset price increase is related to higher demand and low supply of properties. Robust rental prices are also related to high demand for rentals and low supply. Market Economics: If the population is declining and the population is aging, property prices will come under pressure because more property exists with less people. And vice versus. Simple market economics of supply and demand. Certainly not rocket science. Regional Study: So in this Special Report we will explore demographics for a few countries, with special mention of the UK – then give some examples of regions within the UK that will do better than other simply because of their demographic trends. This will give you pointers to the long term property price trends in different regions and countries. India and China: Back in the year 2000, most knowledgeable economist were predicting the western economics would struggle against China up to 2015, Japan would stagnate then China would cool off post 2015 as the population growth slowed. The India would take its place from 2015 to 2030 with the biggest GDP growth rates. These prediction seem pretty accurate so far. Western economies have really struggled, as China has supplied about half the world’s growth, though this started to slow in early 2013 and seems on a declining trend. Grad-to-Granny Ratio: If one takes the number of graduates divided by the number of retiring people, this ratio gives a pretty good indicator about where a country’s economy is heading. Some examples supplied by Fredrik Nerbrand from HSBC (www.Cityam.com). 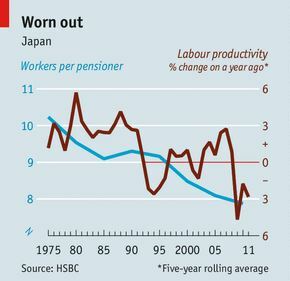 As the population ages, the overall productivity slows then declines as has been experienced in Japan (see chart below). It’s almost impossible to break this cycle – it’s like swimming against the tide. Of course – this form of economics is flawed and dangerous – can even lead to currency crashes and hyperinflation, but essentially the USA, UK, Europe and Japan now seem to be working in concert to print money, suppress their currencies together and encourage older people to risk their money to create some form of GDP growth. We are all swimming against the tide. But some countries are far more precarious than others. Increasing unsustainable Debt: One trend is the mountain of debt just continues to increase – at almost e xponential rates – at least sharply rising rates. There is no way this debt can ever be paid off. Debt payments with any realistic Central Bank interest rates like 6% would bankrupt almost all private companies, individuals and public sector entities. There only option is now to keep printing to debase their currencies – the economies of USA, UK and Japan are definitely hooked like a drug addict on cheap currency and printing. Take away this drug, the patient would go cold turkey. The bond market prices would crash and interest rates sky-rocket. Our view is they will have to keep printing when the economy slows again – partly because of the demographics and retiring babyboomers. This is one reason why we are so bullish on gold ($1330/ounce) and silver ($20/ounce) prices. We think they should double in the next few years after everyone realises the patient is on life support – and cannot manage without the printed money drug. They are also countries with no oil or gas production and huge energy imports. So just don’t expect a big turnaround in these countries – it cannot happen with such an aging population. These countries also tend to have low immigration levels – which does not help their GDP growth. Ireland is another example, albeit their demographics are marginally better – but many Irish have moved overseas to find work as the economy has been battered after the construction boom went bust in 2008. 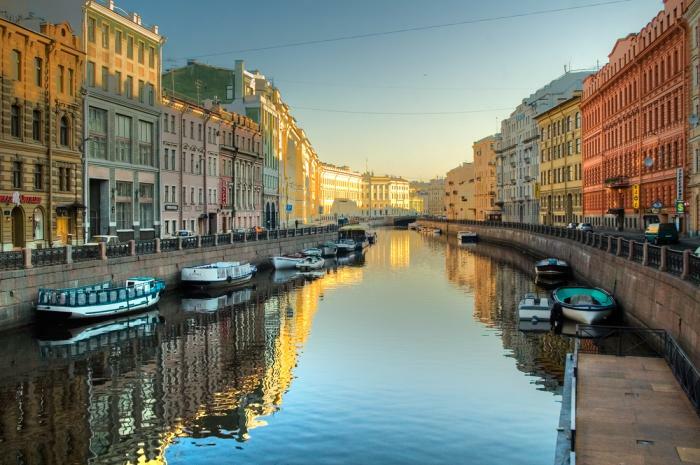 Ex-Soviet: The ex-Soviet countries also have aging populations – when fertility rates were ve ry low in Russia, Lithuanian, Latvia, Estonia, Ukraine, Poland and particularly the old East Germany. So these countries-regions will also struggle with aging populations, although Russia has huge gas, oil and mining resources at its disposal to help. France and Germany also look a bit bleak – but not so bad, particularly western Germany. Holland and Denmark are better off than most, Norway has quite healthy demographics along with gigantic oil and gas production – they seem destined to be the most wealthy in Europe in the next 10-20 years. Sweden is also being managed financially very well and their demographics are reasonably healthy – along with Finland. Now onto the UK. The UK’s population has been increasing – accelerating sharply after the Labour government started in 1997. This has continued at similar trends with the current Coalition from end 2010 onwards. Non UK families tend to have far larger families – and this adds to population growth that then has a positive impact on GDP growth. So despite the UK high debt levels, declining oil and gas production and lack of productivity growth, it does benefit from an increasing population if one deems this as positive. It certainly is for property investor in large part because the planning process is so miserably slow and cumbersome that very few properties are being built. 250,000 new homes are needed every year to keep pace with the expanding population yet on 115,000 are being built. The housing crisis is set to worsen – particularly in London. The UK areas that see the largest population growth will also be the ones that have the younger populations, a higher graduates to retiree ratio and larger number of people starting families. These areas will see the fastest wage growth, economic growth and be most vibrant. They should long term be the best places to invest in property. London is a clear winner – it’s the economic powerhouse of the UK, has the largest growing wealthy, educated, motivated, immigrant population – and family sizes are larger than average. The London population has risen 800,000 in the last 8 years and will increase another 800,000 in the next 8 years. In fact, no-one really knows how many people now live in London. Lots of people come in and out without being properly logged. Any doubter only has to look at how many people use the tube these days compared to 15 years ago – they are jam packed despite more trains, even in a so called recession. Let’s take a closer look at London now. The best places will be where the highly educated people with good jobs are moving in and will eventually start families – earning high wages. These regenerating areas will see house prices rise the strongest along with rental prices. • One of the best areas must be South Hackney – the place is transforming rapidly – a spill over from Islington, The City/Clerkenwell. • Another good place to invest is Shoreditch – or “Tech City” near Old Street as some people call it – this area has the biggest percentage of new start-up businesses in the UK as a proportional to its economy. Yes, these are well educated scientists, internet and arts-media people clustering around this trendy hub – and you know what that’s going to do to house prices! Into this mix you can add Whitechap el. • Tottenham Court Road – this could be a real winner because Crossrail is being built and one will be able to rapidly go in all directions from this station. The whole area within 7 mins walk of the station will boom. • Nine Elms – the new US Embassy and other big developments will stimulate a big increase in the population in this area just SW of the Houses of Parliament – expect prices in Kennington and Battersea to rise sharply also stimulated by a spillover effect from the West End. 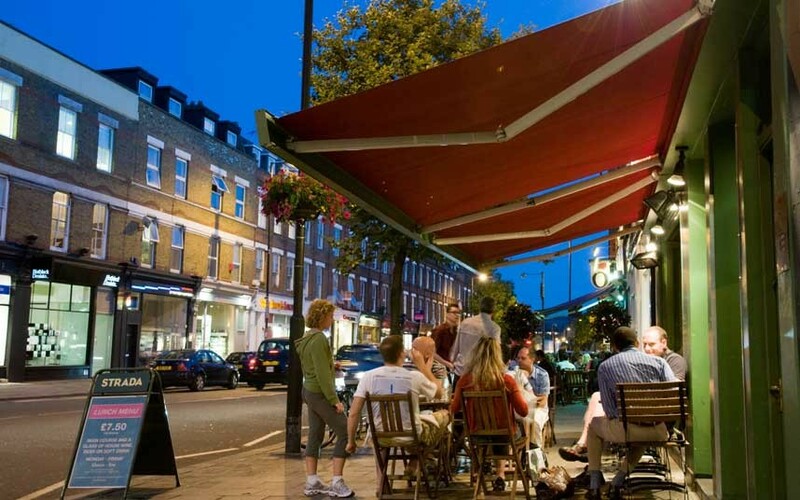 • Peckham-New Cross – the Overground has helped regenerate these areas only 1½ miles south of the city. 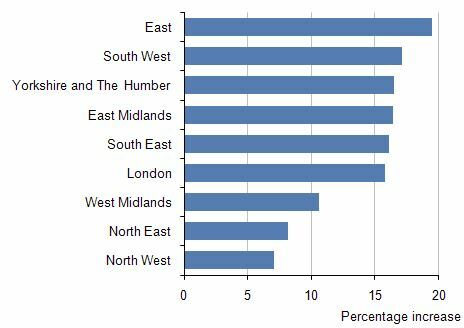 More prosperous educated people from all countries are likely to move in and will help drive up property prices – this is one of the last remaining affordable areas close to central London. A ripple effect from London Bridge will help areas like Surrey Keys and Surrey Canal Road. Definitely on the up if you are looking for low prices. • Paddington – rapidly gentrifying, trendy, very good communications and on the fringe of the West End. A new Crossrail station will be built – W2 has to be a winner. • Earls Court/West Kensington – right on the fringe of Kensington, handy for Heathrow, the West End and big Georgian houses being renovated. Knocking down of Earls Court Exhibition Centres and Lilly Road Warehouse should transform the western fringe of Earls Court. Close to West Brompton station properties are a little cheaper on the way to North End Road, which is rather run-down in comparison – has a long way to go, bit still handy for the West End. For the real insight into which areas will see the largest rises, see our overview of new developments and Crossrail stations that will particularly help property prices within 7 minutes walk of these locations. All these areas will see wealthy families move in with strong employment prospects self-reliant on private sector businesses in new and expanding areas like the internet start-ups, finance, education and general commerce. The grad-to-granny ratio will stay high or increase. New Quay in Mid Wales: Now let’s take the other extreme. New Quay in on the mid Wales coast. 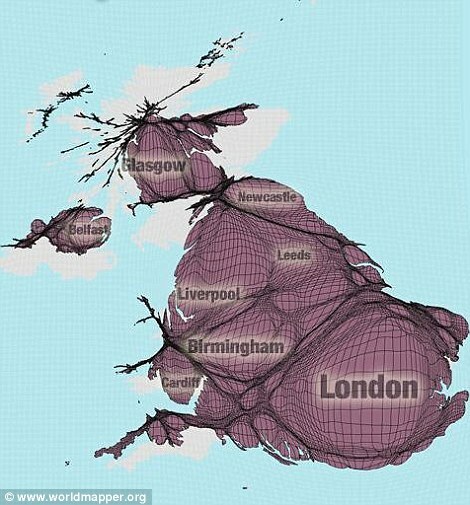 Very little immigration, young highly educated people leaving for the closest cities like Cardiff and Birmingham 4 hours drive away. The population will age, it’s too far to travel for a holiday home for most people, the economy is very reliant on the public sector which is being cut back and the aging population of retirees don’t have much money on the whole. Why would property price rise sharply? Why would rental prices rise sharply. It difficult to see how business and property investors could make good returns in a place like New Quay. Broadband communications are poor, there is not much for young people to do especially out of season and it rains a lot and is windy. It’s tough seeing big economic growth in New Quay and the grad-granny ratio is likely to rise sharply as the aging babyboomers hunker down and retire spending as little money as possible. No, this is not Sandbanks in Dorset, it’s a sleepy harbour village in mid Wales miles from anywhere. It’s beautiful, but it sure isn’t the place for property investors to easily make high returns. Even maintaining a property is difficult because of the long distances to DIY/builders merchants and tough weather conditions with village facing NW. We hope this Special Report has given you some good insights into why some areas see prices rising at 5-10% whilst other areas have seen prices drop 25% since their peaks in 2007 and are staying in the doldrums.